The history of art is a history of names. From art historians identifying the makers of ancient Greek sculpture to connoisseurs arguing over the authenticity of a work by Rembrandt, the name of the artist has been highly valued not only as an authorial indicator but also as a commodity. Today the artist is often reduced to a brand name, such as when the Museum of Modern Art promoted an exhibition of Pablo Picasso's work using the artist's signature as a logo, or when a collector says he owns a Koons instead of a sculpture by Jeff Koons. The place of the contemporary artist in the history of art can rely as much on hype, promotion, and celebrity as it does on creativity and artistic innovation. Inclusion in respected art magazines and journals both demonstrates a certain level of status and success for an artist in the present, and helps integrate him or her into a larger historical narrative. Taking Artforum's forty-sixth volume as a point of departure, Martin Brief explores the power that art magazines have held, and continue to hold, in the creation of art history—and how artists' names function in the process. 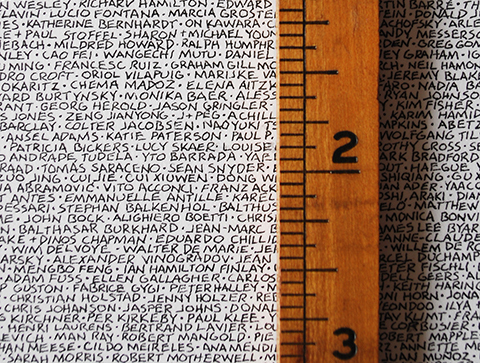 In this series of drawings, Brief lists every proper name—artists, critics, curators, authors, filmmakers, theorists, philosophers, and more—that appears in ten issues of Artforum from September 2007 to Summer 2008. Culled from articles, interviews, reviews, and advertisements, Brief's ten works index many of the players integral to the creation, promotion, and discussion of art during this particular historical moment. 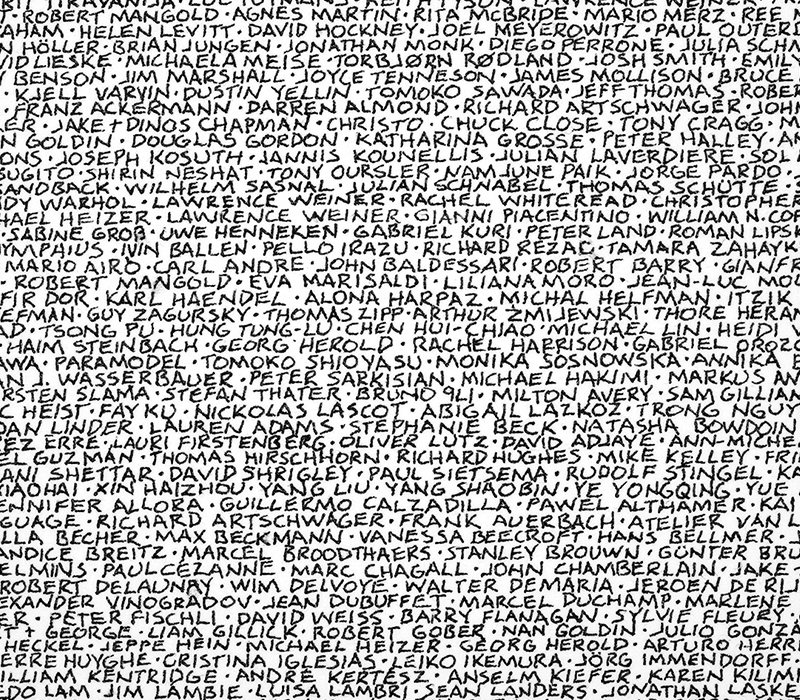 Brief writes all names firmly in ink on white paper, from left to right in the order of their appearance, in rows from top to bottom, and in all capital letters. Each is separated by a single dot. 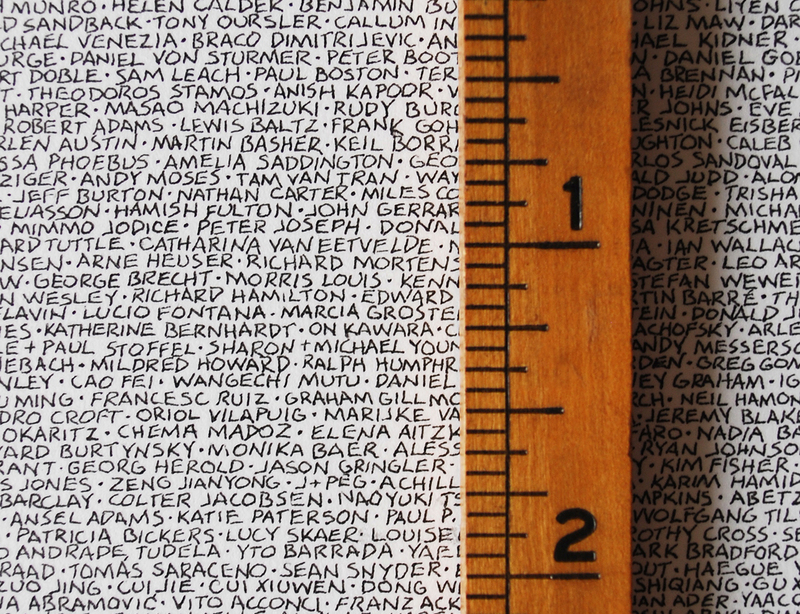 Because approximately 2,500 to 4,500 names are printed per issue, the size of the handwritten text is adjusted to fill a space that matches the dimensions of Artforum's unique shape: a 10.5-inch square. 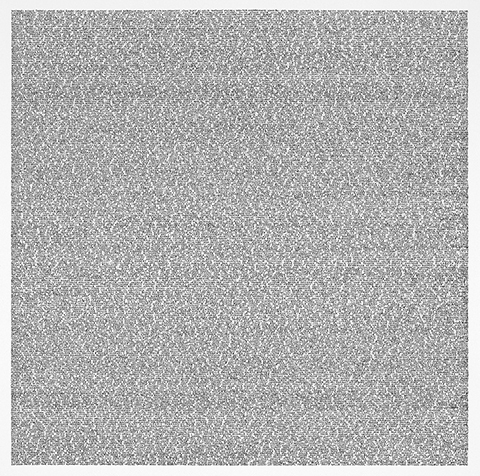 From a distance, the text that comprises the drawings' form looks abstract, not unlike the continuous flickering of television snow. 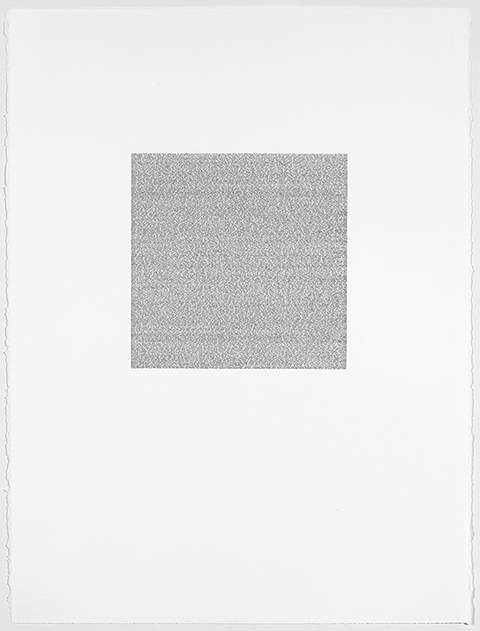 Here Brief's work recalls the meditative, systematic grids and lines in paintings by Agnes Martin, Sol LeWitt's instruction-based wall drawings, or Tara Donovan's repetitive use of inked rubber bands in her patterned drawings. Up close, the details reveal an overabundance of information. 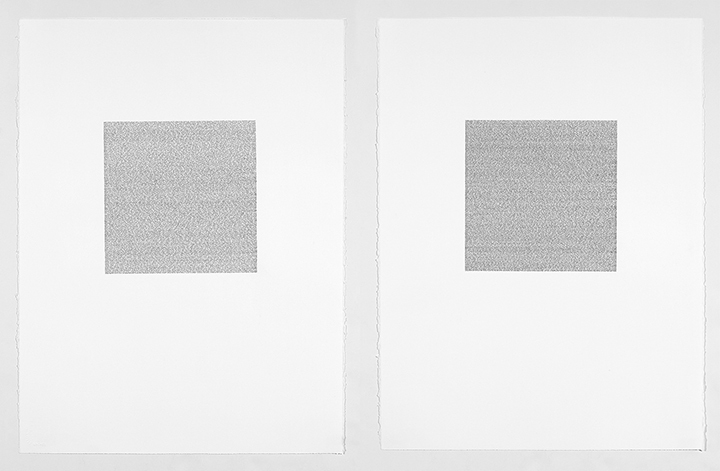 The drawings evoke the visual and programmatic strategy of classic Conceptual Art: a sober black-and-white appearance, language used as a medium, a serialized process, and a critical intent. But in its totalizing goal, Brief's series more closely resembles the ideas in visually oriented conceptual works like Ed Ruscha's Every Building on the Sunset Strip (1966), an accordion-style foldout book that presents deadpan photographs of the very subject of its title, and Douglas Huebler's Variable Piece #70 (1971), an impossible project in which that artist strove to photograph every person alive. Brief, however, dispenses with photography's literal depiction for an entirely linguistic one that emphasizes an idea over its physical manifestation. Although viewers have only words to look at in Brief's work, they are free to create their own visual associations. What specific images ome to mind when reading the names of Mike Kelley, Barbara Kruger, and Sophie Calle, all of whom have had long, diverse careers? Sometimes those associations fail to materialize: How does a viewer picture the face of a critic who he or she has never met, or imagine work by an artist whose name is unfamiliar? Name recognition is key, especially when the exhibiting, viewing, and collecting of contemporary art—and the critical writing on it—occasionally devolve into name-dropping. Further, since the majority of the names in Artforum come from expensive paid advertisements, Brief's project reveals that access to the magazine, and to the formation of art history, can be a matter of economics. Advertisements eventually become part of the historical record, and those galleries and museums with discretionary funds can choose to buy their way in. Brief's work, though, is less a cynical critique of these practices than a leveling out of the art world. Twenty artists' names squeezed into a quarter-page ad are as prominent in his drawings as those of famous art stars who command full pages. 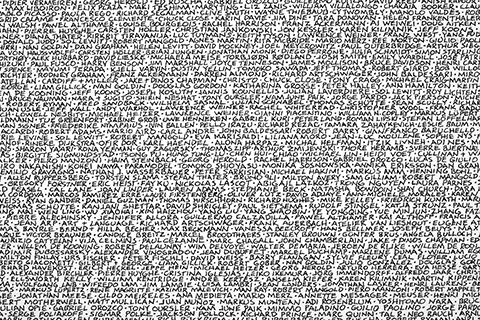 At the same time, Brief's formal, rigorous labor reinforces the importance of names in art history—and Artforum's role in creating that history—by indiscriminately and permanently recording the names of thousands of artists. All have the potential to become important names in future histories of art. Christopher Howard writes for In Terms Of and is managing editor for the College Art Association, working on CAA News, among other digital projects and printed publications. He also served as editor of caa.reviews, an online academic journal of book and exhibition reviews, from 2001 to 2005.